Last weekend, Lunar Phase hosted an SNK-focused event named Lunar Eclipse Phase: SNK at Next Level Arcade in Brooklyn, New York. The games hosted ranged from classic titles such as Samurai Shodown II and The King of Fighters ’98, to more modern titles like The King of Fighters XIII and The King of Fighters XIV. Numerous players came out from all over for the two day event, which I had the pleasure of attending personally. While Friday was centered on side tournaments and exhibitions, Saturday was focused on the main tournaments. 9 games split between two streams provided by Lunar Phase themselves, and Min from 2Old2Furious, combined with 61 different players fighting for the gold, made an amazing weekend that was fun for everyone. Including the numerous spectators who came out to see what SNK games are all about. After the event, I took a moment to sit down with Lunar Phase co-founder, LP | Monta and conduct a brief interview about how this event came to be. I also gained some insight into the operations behind the scenes. Deezee: First off, I want to thank you for hosting such an awesome event last weekend. I had a great time and it looks like everyone else did too! Just to give everyone a background on how this event came about, tell us a little about Lunar Phase and what they do. Monta: Lunar Phase is an event hosting and broadcasting group that mainly focuses on the FGC. While we mainly focus on French Bread titles such as Under Night In-Birth Exe: Late(st) and Melty Blood; we’ve also been very interested in doing other events that may have never been done before or are rarely seen within the FGC. We focus on the community first and E-Sports second. Deezee: I definitely felt like I was hanging out with everyone rather than competing in a serious environment. It’s a good way to help battle nerves while playing. So, what brought up the idea to do an SNK-focused event? Monta: Well 2 things: One of them was seeing the SNK guys come out every other week or so just hang out and play their game (usually KoF02UM and KoFXIV). Second was inspiration from an event called Makai Cup. Which is a Vampire Savior specific event and thinking that it’d be cool to try implement something similar for the SNK community. Deezee: Ah, very cool! We had a lot of notable players come out last weekend. I was very surprised to see some of the Louisiana and Texas crew on top of players from all over the Northeast. Were you expecting so many people to come out? Monta: I was very optimistic on the potential for people to come out but it was definitely a bit more for certain games then I expected there to be. My biggest surprises were definitely the Louisiana group, El Rosa and the guys from Brooklyn Video Games. Did not expect Garou to reach 20 entrants like it did either or even the 30 people for KoFXIII. Deezee: If you give people a place to play their games, they’ll find a way to show up. How did it feel when SNK opted to sponsor the event? I even saw some Japanese tweets mentioning Lunar Eclipse as well! Monta: Felt pretty good to be more “official”. Glad to see SNK supporting events the way they do with things to give out to people who play their games and other support programs. I actually didn’t even know that some Japanese were talking about the event. In the future I would like to bring some and see more international players from different parts of the world. Deezee: Yeah. It was very kind of you to raise money to fly out Luis Cha to participate. What made you want to bring a player to New York to compete? Monta: I wanted to increase the hype for the event and bring more of the SNK community together. The added competition is always fun to watch as you see our local players trying to take him down in the games that he’s so well known in. I’ve also done this for Super TSB last year where I flew two Under Night players from different regions to come compete with us, and overall it definitely improved the quality and enjoyment of that event. In the future I would like to keep doing this. Deezee: That’s good to know. From all the feedback I’ve read on Facebook and Twitter, it seems like this past weekend was a success. How often would these SNK-focused events come up if you continued to host them? Would you do anything differently for next time? Monta: An SNK Event at this scale will continue to be an annual thing. Although as an effect of the event other community members such as DaiAndOh, Tamashii Eater, and Animonk are trying to run events and groups for Samurai Shodown 5 Special, Garou and The Last Blade 2. I would also like to keep seeing KoFXIII ran here in NYC; I feel that it is a game that is deeply loved and overall it’s always fun to watch. If I did this again, I’d try to make it a Saturday/Sunday Event so I could split more time between games. I would also have to have a cap for the amount of games someone can enter; People entering 8 games was definitely crazy. For sure I’d try to split the time between the KoF games a lot more and try to give people more room to run casual sets. Deezee: Despite some games running overtime, the overall feel of the event was overwhelmingly positive. Thank you again for giving our community a fun weekend! Before we finish up, where can people watch and support Lunar Phase? Monta: You can support Lunar Phase by following our Twitter. You can also tune in and watch our events from home via our Twitch Channel. If you are interested in hanging out with us, join the Northeast French Bread Discord. Even though it is French Bread, we play and talk about a wide variety of games and topics. I can personally say that Lunar Eclipse: Phase SNK was one of the best regional events I’ve been to in a long time. Lunar Phase did a great job hosting our community, and I look forward to seeing their group grow in the future. Doctor Butler even created a hype reel highlighting some exciting moments from the weekend! If you wish to take a look at the brackets and results from the event, feel free to check them out here. GAROU COMMUNITY X DREAM CANCEL COLLABORATION! At the dusk of 2D fighting games SNK made their last stand putting all the knowledge they had gathered over a decade making fighting games into one of the best ever made; Garou: Mark of the Wolves. The game has inspired people from all over the world into making a big community with headquarters in Discord. And now we are collaborating with Dream Cancel to share our knowledge and passion for the game. Correct Frame Data (from japanese sources). English Wiki Translated From Japanese One (work in progress). Let’s begin this Maximum Mayhem, see you in the next post! I was asked to write down my thoughts about heading to the recent edition of the Chicago area winter tournament stalwart: Frosty Faustings. Traveling from DC headquarters up in the Twin Cities, MN to Chicago twice annually (for both Frosty’s and Combo Breaker) is a time honored tradition now for the members of the KoF scene in Minnesota. We drove down Thursday morning so we’d have lots of time to settle in and find other players to get games in with. For its entire existence Frosty’s has been one of the premiere national tournaments for anime players, especially Guilty Gear, but it has also for many years attracted Midwest KoF scenes (MN, Chicago, Indiana, Ohio etc) to meet up and duke it out. 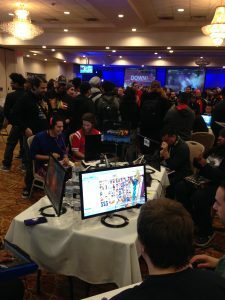 Over the last three years, tracking with the overall expansion seen in other FGC events, Frosty’s has gone from being run in medium sized bars to full blown majors-sized venues. Last year there were definitely struggles seen in venue size being too small, split areas of where brackets were run, as well as some very late running brackets. We chatted about these issues on the way down and hoped the move to an even larger venue would improve the tournament experience. The venue opened up on Friday and we made our way down from the also crowded overflow hotel just down the street. Already a testament to the increased popularity of the Frosty’s event was that the venue hotel had sold out Saturday night sometime just after Thanksgiving. We were not accustomed to having to be worrying about getting a room at this normally modest sized regional event, so we late to booking a room. Getting to the venue the scope of why this happened was clear. Four years ago Frosty’s was being held in a moderate sized bar/gaming space called Game Pazzo in a strip mall. We walked into a venue that was at least as big as the old UFGT/first Combo Breaker venue, which is to say a large sized major tournament. It was quite impressive that they’ve managed to evolve this far! Across the board there was a electrifying atmosphere all weekend as news of Xrd Rev2, the first major US tournaments for both SFV season 2 and BlazBlue CF happening here and a bevy of top players in each game traveling to the event, brought a truly majors-tournament level of excitement. Having traveled to CEOtaku in October this was the second major I have attended for KoF XIV. Friday I spent all my time in the venue getting games in with players from Atlanta, Michigan, San Francisco and lots of other places. Outside of the first UFGT during the KoF XIII era, I have never attended a tourney that matched this one is the amounts of different KoF scenes that have been able to make it to a single event. It was very heartening and fun to get so many matches in with so many different people. We tried to go to sleep early, but struggled to leave such a lively venue. Saturday for tournament day the heavy hitters showed up. Top players El Rosa, Violent Kain, Kusanagi, Goichi, KCO_Pedro and KaneBlueRiver all traveled to the event, as well as local area gods James Jr., Mario E and Mooney Blues. It was a stacked tournament and I was sad to miss quite a few great matches in pools that could easily have been a grand finals at a lesser tournament. All told more than 70 people registered for the KoF XIV tournament. Top 8 was the most exciting I’ve see live so far for a XIV tournament. With the absolute thriller being Mooney Blues v Goichi from Japan which I won’t spoil for you. As a game XIV seems to be developing a fun to watch ‘high stakes’ sort of meta with people fishing at mid to long range into Max Mode or baiting movement at close range. Violent Kain was especially good at punishing people for ill timed movement options. After the tournament was complete everyone stuck around the stations to get in more casuals even though most were exhausted at that point. Violent Kain and El Rosa recorded a FT10. KCO_Pedro got lots of games in with anyone willing. But, one of my favorite moments of the event was late on Saturday night as a dozen or so of us just stood back and looked at the character select screen explaining our thoughts on various characters and where XIV might go in the future. My bounty for getting top 8 this weekend in KOFXIV at @FrostyFaustings ! He also gave us great advice in that whenever we can do this (meaning travel to tournaments) we should. Kane said there were a couple players back in Chile that we easily as good as him, but simply couldn’t travel. Solid advice and motivation to try to get to as many events outside your scene as possible. We drove home Sunday with hours of discussions about where XIV is headed as a game, which characters need more exploration and of course what we can do as a scene to improve our play. To end this I really need to say what an amazing job the TO’s of Frosty Faustings did this year. They have evolved so far in the nine years and this tournament ran as smooth as any I’ve ever been to. If anything they may have already outgrown the size of their event again by next year. Hope to see everyone again at Combo Breaker in May. In this episode we will be talking with NYC player A3 Religion! 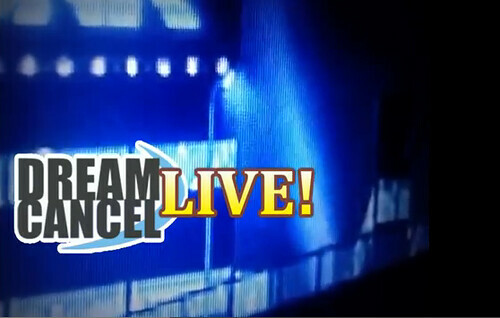 Tomorrow night at 9:30pm CST (7:30 PST/10:30 EST) will be our fifth episode of Dream Cancel Live! We will be discussing how to properly build and grow a strong local KOF scene in your area. This will be a good listen for players who are struggling in places where the KOFXIII competition is low, and you are searching for solutions to fix that problem. We will also discuss the recent KOFXIII tournaments that were held this past weekend including players from APEX 2014, and we will talk about Japan’s MixupNight tournament. Also, we will announce upcoming tournaments and events, and do Q&A from our chatango chat room! Players that are invited to the discussion panel tomorrow will be James Jr., Malik, FM Sway, Killey, and AS|Reynald. You can watch the show live here on the front page of dreamcancel.com! The live embedded video will placed on the front page 30 to 45 minutes before the show starts. Please use the dreamcancel chatango box to chat with other players and to ask questions to be answered on the podcast! Remember, tomorrow, Wednesday January 22th at 7:30pm PST, 9:30 CST, 10:30 EST!